The white team poses for a photo op outside the Hickory Street Bar & Grille before the Austin game. Our Games in Austin and Providence were great fun. We lucked out with perfect weather, interesting chess games, and enthusiastic participants in both games. As the colder months bear down on us, we will be busy planning new games for the spring and summer, and we'll be working on the first-ever Drunken Chess Masters Tournament, scheduled to take place in Brooklyn in January. Check back for more information! 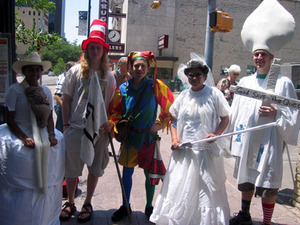 The next game will take place in Oakland, CA on August 6, 2005.
the human scale chess game was invented by brooklyn-based artist sharilyn neidhardt. the game was originally invented for the first psychogeography conflux in may 2003. the mechanics of the project are simple. each participant plays the role of a human chess piece. the board is eight square blocks of a city. somewhere in the middle of the board, two expert players will be playing a game of chess. after each move, the appropriate piece will be called via cellphone and given instructions on how to move. those of us who play chess struggle to maintain a mental image of the entire board, and to view the pieces as a system, rather than as independent actors. the human scale chess project offers an opportunity to see the game from the unique perspective of a single piece. to participate in a game, you must have a working cellphone with reliable service. SMS and other wireless messaging devices may also be eligible. you must be free for about 3 hours on a weekend afternoon. costuming appropriate to your piece is strongly encouraged, as is camping it up as much as humanly possible. gamepieces please plan to be excruciatingly on time. center pawns (d and e pawns) can expect to be captured early. captured pieces can return to the base for a beer. captured pieces can return to the gameboard as documentarians. bishops and knights can expect an energetic game, covering a lot of territory. rooks can expect to have a pretty mellow first half of the game, and a very energetic second half. kings will likely have a low-key opening game, and a very energetic endgame. kings will be on the board the longest of any piece. flank pawns will have a pretty low-key game, moving only a block at a time. flank pawns may be promoted (usually changing into a queen) upon reaching the opposite end of the board. queens will have the most athletic role. volunteers who sign up early can select their roles. pieces may spend their time on the board as they please, as long as they are available to answer the cellphone calls from central command. you must bring a working cellphone or pager. consider a hat or sunblock. bring a camera, recorder, or other device if you want to assist in documentation. (check out our fotolog for ideas). check the weather (or, in the case of san francisco, guess) and dress appropriately. we will play rain or shine. you may bring rollerblades or a bicycle. you can travel from one square to another in any manner you choose. you may bring reading material or video games or anything else that helps you pass the time. 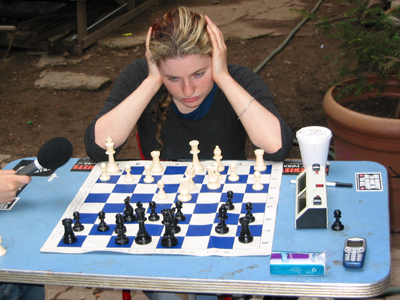 women's international master jennifer shahade contemplates a move during the lower east side game. photos posted by participants in the san francisco and vancouver games. is a project sponsored by the chess club. a conceptual perfomance on urban streets.